Please note as we are a US company, we cannot process Cuba Tourist Cards. The information provided is for educational purposes only. Anyone who wants to visit Cuba as tourist and travel via US airport must apply for a USA Tourist Card also known as a pink card. The Tourist Card allows you to enter Cuba for leisure or recreational purposes for up to 30 days. The card solely depends on where you are coming from and not nationality. All travelers require tourist card to enter Cuba, together with a current passport (from any nation). A copy of your passport - valid for at least 6 months after your departure date from Cuba. Your flight itinerary to and from Cuba. Each applicant must present copy of travel insurance for the entire trip. If you are traveling with minors: They must have their own Tourist Card even if they are travelling under their parents´ passport(s)." The USA Tourist Card is a single-entry visa which allows travelers to enter Cuba for touristic purposes for a maximum stay of 30 days starting from the entry date. All travelers require tourist card to enter Cuba, together with a current passport (from any nation). These are the only two documents a visitor needs. All Tourist Cards are the same, except if you are flying direct to Cuba from the US. These are more expensive and pink in color. If you are a US citizen flying through another country besides the US, the typical green tourist card will suffice for travel to Cuba. The Tourist Card is valid for 30 days and is non-transferable and non refndable. Tourist Cards grant a maximum stay of 30 days (90 days in case of Canadian citizens) and can be extended once for the same period. All Tourist Cards are the same, except if you are flying direct to Cuba from the US. These are the USA tourist card, they are more expensive and pink in color. How long is the USA tourist visa (pink card) valid for? The Tourist Visa allows you to enter Cuba for leisure or recreational purposes for up to 30 days. This can be used once within 180 days of the date of issue. Your Tourist Visa Card may be extended for another 30 days when in Cuba at the immigration authorities office. Once arrived to Cuba, what do I need to do or present? Once arrived to Cuba, the Cuba Tourist Card must be stamped on both sections at the back of the visa. The information must coincide with that in the passport. I am US citizen but I am visiting another destination(s) before flying to Cuba. Will I need a different type of tourist card? Yes, You will need to apply for the International tourist card (green card). This is the link you can request for the tourist card available to apply from outside US. What do I need to do once I received my USA tourist Card (pink card)? You must fill-in with your information. Use a black pen and read all fields before filling it in to avoid making mistakes. Have your passport handy, as the form requires that you write-in your passport number. Any errors on the visa may result in the visa being null and a new one must be purchased. Fill-in the visa with your Last Name, First Name, Birth Date (day, month, year), Passport number and Country of Citizenship. Please note that date format is Day, month, and year. All information should reflect exactly what is in your passport. The left side and the right side must be filled in with the same information. Upon arrival at Cuba, what do I need to present? Upon arrival at Cuba, Cuban immigration officials will keep half of the tourist visa. Keep the second half of the visa for departure from Cuba. The information on a Cuba Tourist Visa must coincide with that in the passport. I am US citizen. Can I apply for a pink card through this website? The card solely depends on where you are coming from and not nationality. 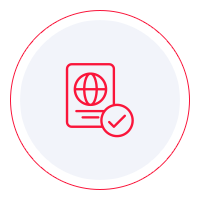 If you are not an American citizen/resident (green card + passport from citizen country) and require additional documentation, please verify what additional documents you will need upon return to the U.S. For example, as an International citizen residing in the U.S. under a student visa may require additional documentation to fly back into the U.S. The same may apply if you are a ESTA visa or multiple entry visa holder. I am flying via US airport. Can I apply for a tourist Card through this website? We offer you the two types of tourist card. If you are flying via US airport you can apply for your USA tourist visa here. I am travelling with my young children. Do they need their own Tourist Card? I am entering in Cuba twice within a month. Can I use the same tourist card twice? How long does it take you to issue my Cuban Tourist Card? We generally issue your Tourist Card on the same or following working day. I am staying in Cuba longer than 30 days. How can I extend my tourist card? Your Tourist Visa Card can be extended only in Cuba for another 30 days at the immigration authorities office. The USA tourist card is for one single entry. No, You only need to fill the form, providing all details exactly as they appear on your passport. Can I request a Tourist Card for my partner, kid(s), parents, friends, etc..? Yes. Just make sure to have their correct passport information. What type of delivery options are there? We are a group of 5 or more, how do we order? During your application, you will be able to add more travelers. Can I apply for the tourist card with an official passport? No. If you hold an official passport you must to apply for an official visa (attending visa/A6). For this, you will need to apply at the embassy with supporting documents: travel insurance, hotel booking, itinerary, invitation letter and tentative program. Is the USA Tourist Card transferable? Yes. You have to fill it in with the passenger's information and once you have filled it you can use it. Perhaps you may be aware of this, but until 2014, as a US citizen, you could visit Cuba only on an escorted tour. You may have heard of things like Cubans do not get along well with Americans or the other way around. But, in 2014, President Obama took a trip there. He was the first American president to visit Cuba since 1928 when Coolidge took a trip there. He managed to lift some of the embargo between the two countries, enough so that US citizens can travel to Cuba for tourism purposes, on their own. As a result, in 2016, more than 4 million Americans visited the beautiful country. When you think of Cuba, all you imagine are the white sandy beaches, the blue of the Caribbean, the smell of cigars, and let’s not forget the charm Havana has. The narrow streets lined by baroque architecture and the salsa music will surely enchant you, but there are a few other things you should probably be aware of before departing. The first one is that you need a tourist card. You cannot enter Cuba without such a document. Lucky for you, you can get that at airports and online. The requirements are simple to meet, and you should get the card in just a few days at most. It is also cheap. You may have some difficulties in finding accommodation there, but nowadays, the internet can solve virtually any problem. Even so, do not forget that you need some documentation to get on a plane. Before you leave, make sure that you have travel insurance. It is true that most countries will ask for proof of medical coverage, but the fact of the matter is that you could be denied entry if you do not have insurance. You may or may not be required to present the policy at immigration, but if you are asked, do you really want to take that chance? Most people do not. And after all, travel insurance can actually come in handy. You never know what could happen. Knock on wood, but accidents do happen, and you do not want to be on foreign soil without insurance, do you? When you get to Cuba, it would be preferable to have cash on you. ATMs are available, but you may want to avoid the withdrawal fees and exchange fees. Some people go there with Euros and GBP because Cubans have excellent exchange rates for them, but the US dollar is close to a scam. Under no circumstance should you go to Cuba with Australian dollars because they have no idea what to do with them. Plus, there are two currencies in Cuba. First, there is the CUC, or the Cuban dollar, which is pretty much the same with the US dollar. And then there is the CUP, the Cuban national peso. One CUC is about 22 CUP. Lastly, if you do plan on withdrawing money from an ATM in Cuba, you should let your bank know about your trip. Since fraud happens, you may find your accounts blocked if you do not notify your bank about your trip. Being in a foreign country with no money is not something you want. When it comes to food in Cuba, you should not expect much. The country may offer plenty to see and experience, but the food is not one of them. Trade is not their best advantage, and their food is a bit bland. Even so, you can fix that by taking some salt in your luggage. It is silly, we know, but unless you want to eat meh food on your trip, salt is your best option. You should also be aware of the fact that the internet is a commodity in Cuba. It has not really taken off, so to speak so you may want to learn how to get around without it. Lucky for you, there are apps that you can download, and they work excellently offline. Getting lost is not an issue, at least not as before, but you still want to stay away from over-crowded places. For example, Havana can be stacked with people during their most busy season, and not all of us appreciate the noise. The point is that you can get around pretty well without internet, but make sure to have at least some maps that work offline. Cuba is one of those countries where you need to worry about drinkable water. You should never drink tap water, but only bottled water. There is a catch, however. Local vendors are very aware of the fact that tourist will not drink tap water, which is why they will try to sell you a bottle of water at a price three times higher than it actually is. So just for reference, a bottle of water should not cost more than 0.70 CUC. But vendors will try to sell it to you for 2. As long as you know the real value of water, and you let them know that you know, you will drink water at a decent price. As for when it is the best time to visit Cuba, it depends on your preferences. Most people like to go to Cuba from November to March because that is the coolest and driest season. However, if you do not like crowded places, you should choose another period. May through June I the wet season so you may be soaked pretty much all the time. July through November is a ‘NO-NO’ period because that is the hurricane season. We all know what happened last year, and you do not want to be around that. Even if there are mild phenomena, it is still pretty windy, and it may ruin your vacation. Overall, Cuba is a country worth visiting. They may be a little behind from all points of views, but it has a particular charm that will attract you like a moth to the flame. The street musicians playing salsa, the very well dressed people (go figure), and the surroundings will give you unforgettable memories. Sure, there is some effort in finding accommodation and whatnot, but it is worth it.